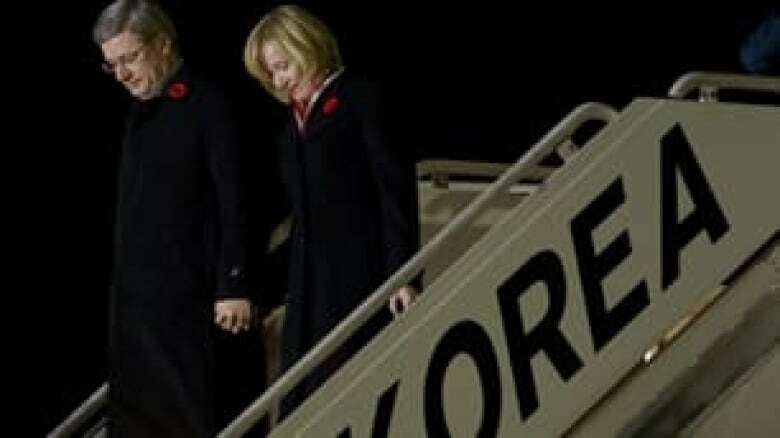 Prime Minister Stephen Harper arrives in Asia for meetings meant to revitalize the global economy. Prime Minister Stephen Harper has arrived in South Korea to meet with other G20 leaders on what to do next to strengthen the global economy. In a letter to the G20 leaders last week, Harper reminded them of promises made during the June summit in Toronto to cut deficits and debt and subsequent agreements on guidelines for their current accounts. Ahead of opening talks at the summit, the prime minister will also join his Australian and British counterparts, Julia Gillard and David Cameron, for a joint Remembrance Day ceremony. The aim of the G20 meeting is to boost employment, spur economic growth and avoid a harmful currency war. Leaders are poised to agree in principle to make sure their trade, investment and fiscal balances don't go too much into the red or the black. But several emerging market countries are suspicious of recent U.S. Federal Reserve moves to pump $600 billion into a bond-buying program — essentially creating money. They say the so-called quantitative-easing could trigger a round of competitive exchange-rate devaluation, or a currency war. There is growing anger over the U.S. decision. Russia has said that the U.S. needs to consult with all key players in the world economy before taking such action, while German Finance Minister Wolfgang Schaeuble called American economic policy "clueless." China and Brazil have also been critical. But Canada has been quietly supportive, with officials saying that the drastic measures being taken in the U.S. show how dire the situation is. INSIDE POLITICS: What? No Kimonos? Quantitative easing: What is it?